Tuesday, Oh Tuesday is blowing right in!!! 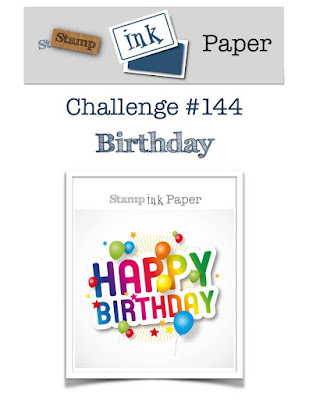 I am back with the Stamp Ink Paper Design Team and we are creating this week with a Birthday Theme!! We had a nice little Easter Weekend. I, however am fighting allergies and the side effects of them. Joshua, my middle kid, turns 10 on Thursday! Time is just flying by. This is his last 8 weeks of elementary school. Next year he heads off to the middle school. 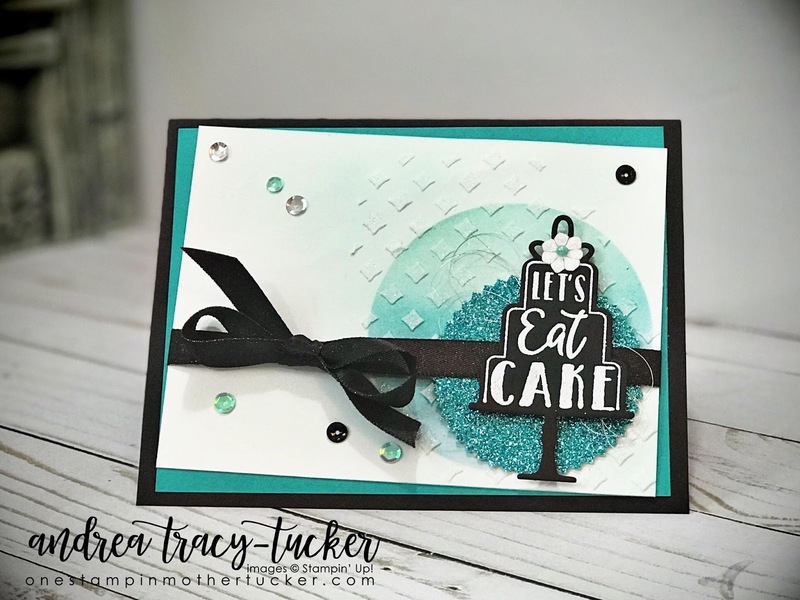 It is kind of funny, I went to my craft room with an upcoming challenge in my head when I made this card... Luckily, Murphy and his law were on my side when I made this a Birthday Card!! As I said above, this was not the challenge in my head that I was creating for. I started with an ombre like sponged circle using my Sponge Daubers with Pool Party, Bermuda Bay and Island Indigo inks. I then used the Pattern Party Decorative Masks with Shimmer White Embossing Paste to create some texture to the card. I adhere the Magic Myths Starburst Punched Glimmer Paper with Mini Glue dots. My fun little cake was created using the Celebration Time Bundle. A nice Stampin' Emboss White embossed sentiment on the Basic Black was just the ticket. I added a nice little flower at the top also using the Magic Myths Glimmer Paper Pack. A nice bow of Basic Black Shimmer Ribbon and some Silver Metallic Thread made this card pop! I snagged a few sequins from the Metallic and Iridescent mix and my card front was finished! Last but certainly not least I matted this on to a Bermuda Bay matte wonky style and then added this to a crisp base of Basic Black! Thank You so much for stopping by today! I can't wait to see what you create with our Birthday Theme! If you like what you see, I have provided a full product list below!